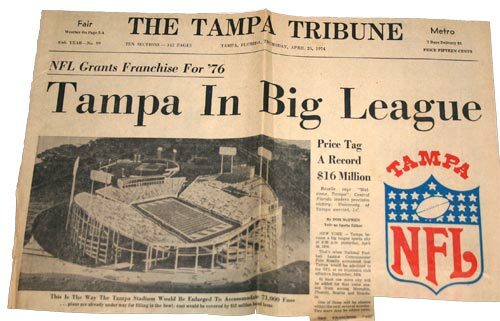 Expansion of the National Football League to twenty-eight teams was an agreed part of the AFL/NFL merger of 1970 and confirmed at the end of that season, but attempts to carry it out did not materialize until after the 1973 season, when it was announced that Tampa would be the first city to get an expansion franchise, at a cost of $16,000,000 which even then was considered a “paltry” sum. Originally the proposed Tampa Bay expansion franchise was awarded to Tom McCloskey, a construction company owner from Philadelphia. McCloskey quickly became dissatisfied with the financial arrangement with the NFL, and backed out of the deal a month later. Hugh Culverhouse, a wealthy tax attorney from Jacksonville, who had failed in his bid to buy the Los Angeles Rams due to an unannounced sale to Robert Irsay, instead received the Tampa franchise. A name-the-team contest resulted in the name “Buccaneers,” a reference to the pirates who frequented Florida’s Gulf coast during the seventeenth century, and which was almost immediately shortened to the familiar “Bucs”. The team’s first home was Tampa Stadium, which had recently been expanded to seat just over 72,000 fans. Despite the profitability of the Buccaneers in the 1980s, Culverhouse’s death in 1994 revealed a team close to bankruptcy, which surprised many observers. His son, Miami attorney Hugh Culverhouse, Jr., practically forced the trustees of his father’s estate to sell the team, which cast doubt on the future of the franchise in Tampa. Interested parties included New York Yankees owner George Steinbrenner and Baltimore Orioles owner Peter Angelos, the latter of whom publicly declared he would move the team to Baltimore, as the city did not have an NFL franchise at that time. However, in a last-minute surprise, Malcolm Glazer outbid both of them for $192 million, the highest sale price for a professional sports franchise up to that point. 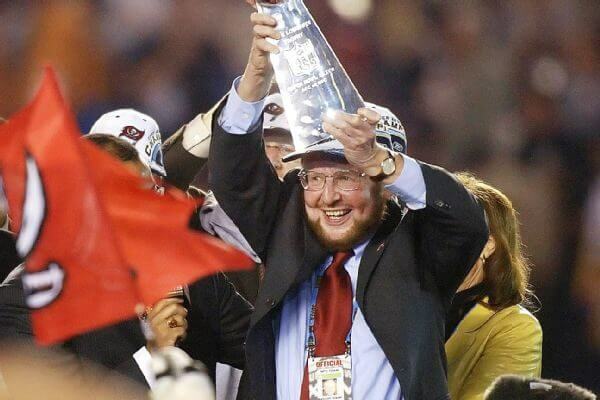 Glazer immediately placed his sons Bryan, Edward, and Joel in charge of the team’s financial affairs, and the family’s deep pockets and serious commitment to fielding a winning team finally allowed the Bucs to become competitive. 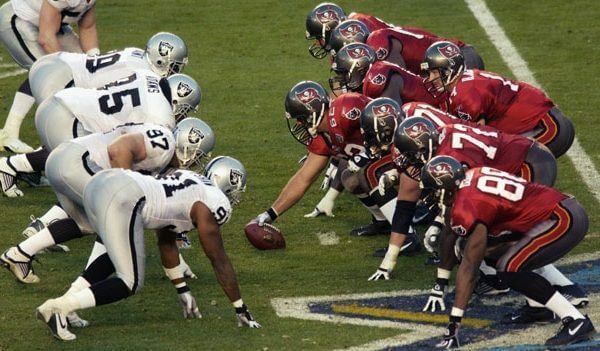 For the 1997 season, the Buccaneers worked with the NFL to develop a more marketable and intimidating look in order to improve the team’s image. 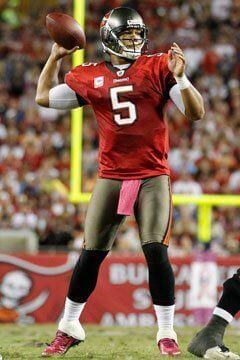 The Buccaneers changed their team colors to red, pewter, black and orange. “Bucco Bruce” was replaced by a red flag displaying a white pirate skull and crossed sabres which is a modified Jolly Roger (similar to that of Calico Jack). The flag was mounted on another sabre. The “Buccaneers” team name was written in a new font, Totally Gothic, and was either red with shadows of pewter or red and white. Orange pin striping, and an orange football, was used to maintain a visual link to the former colors. Chris Berman nicknamed them “the pirates in pewter pants,” a play on the Gilbert and Sullivan opera The Pirates of Penzance. The Buccaneers planned to stage a ceremony in which Bruce was to walk the plank of a pirate ship in Tampa Bay, but he was pardoned at the last minute by Governor Lawton Chiles. 1994 - 1995 / Hugh Culverhouse, Jr.
Who is the greatest Tampa Bay Buccaneers? The Tampa Bay Buccaneers (often shortened as the Bucs) are a professional American football franchise based in Tampa, Florida.